What new image sensor technology is being developed for the next generation of vision systems? That was the question Professor Dr Albert Theuwissen, founder of Belgian image sensor service provider Harvest Imaging, set about answering in his invited talk during the second EMVA-organised European Machine Vision Forum in Vienna, Austria on 7 September. One big area of development is increasing the processing power onboard CMOS images sensors (CIS) through a stacked approach. Early this year, at the International Solid-State Circuits Conference (ISSCC 2017) in San Francisco, Sony presented a three-layer stacked CIS for smartphones, at that time a first in the industry. At the same time there have been collaborations on stacked image sensors, notably from TSMC and Qualcomm, with TSMC providing the image sensor layer and Qualcomm supplying the processing layer. This move from a single company offering the image sensor and the processor logic to multiple suppliers could reduce the hold Sony has on the image sensor market, according to Theuwissen. ‘For sure, this [multiple suppliers] is going to kill the monopoly position of the Sony’s of this world, and basically will lower the cost, or lower the price that we have to pay for these sensors,’ he said. Sony’s three-layer stacked IMX400 CIS has a DRAM layer sandwiched in-between the top photo-conversion layer and the bottom processor layer. Information from the pixels is read out extremely fast in the DRAM layer, and then the data is processed later on at a slower pace. The DRAM can also store about 900 images at low resolution. The sensor has a total of 17 layers of interconnects, so there is a lot of freedom to speed up the device, according to Theuwissen. The device can capture still images of fast moving objects, while also offering a super-slow motion mode. It offers 30fps at 19 megapixels for still images, and 240fps at Full HD for movies. ‘It’s a technical miracle,’ Theuwissen said during his presentation. The CIS released by the foundry TSMC and FPGA maker Qualcomm is an 8 megapixel device – TSMC optimised the image sensor, while Qualcomm worked on the processing. The two layers match in geometry and have the capability of being hybrid bonded to the image sensor. ‘Now you have a completely programmable array underneath the image sensor,’ Theuwissen noted. TSMC and Qualcomm showed that the sensor could be programmed to work with different colour filter arrays, including RGB, RGB and clear pixels, RGB and near infrared pixels, and a 1.5 Bayer pattern. ‘That opens up incredible amounts of capabilities,’ Theuwissen remarked. 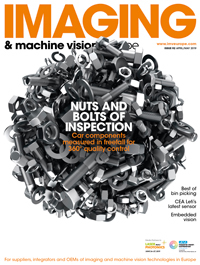 The machine vision market is reliant to a large extent on consumer imaging, as this is where the volumes lie. During a panel discussion at the conference, Dr Dietmar Ley, CEO of Basler, commented that the CMOS image sensors used in industrial cameras now give excellent image quality and that only incremental changes are expected for machine vision. He also said that applications using area scan cameras are growing much faster than those using line scan. ‘From a commercial point of view, the line scan camera business has become less attractive for us [Basler],’ Ley stated. ‘If I’m looking at the cost involved in the illumination, the optics and the integration, then I go for line scan cameras when I can’t get the job done with area scan cameras,’ he added. ‘It means, like it or not, that every customer we have would like to work first with an area scan camera, because of ease-of-use.’ However, he noted there are some applications where area scan isn’t suitable. Other advances in image sensors mentioned during the panel discussion included better time-of-flight sensors, along with a hope for sensors with a wider spectral range.